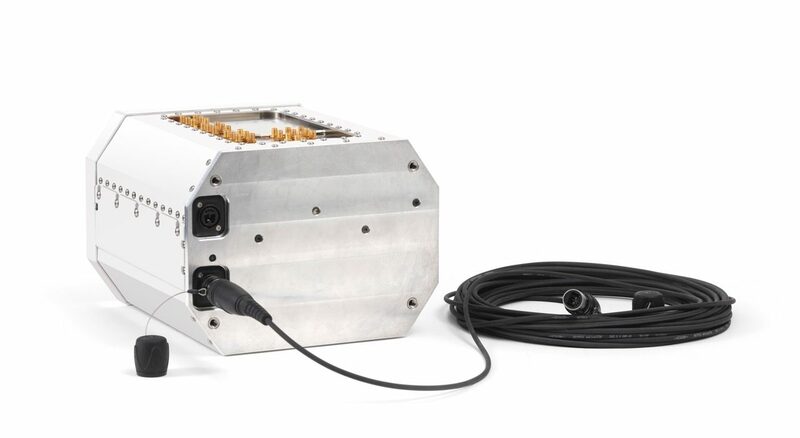 The mobile sensor IZT R5506 samples signals synchronously from all antenna elements in a specific frequency band eliminating the need for additional RF switches. This feature secures short detection times and simultaneous monitoring of one or more channels with arbitrary center frequencies and bandwidths. Only a single hybrid cable delivers power to the mobile sensor and transmits the data to the shelter for post-processing. This makes the installation simple, no losses in the antenna cables affect system performance and signal integrity is maintained over long distances. In the result optimum dynamic range, sensitivity and direction finding (DF) accuracy with any given antenna array are obtained. The mobile sensor IZT R5506 contains up to six high-performance receivers up to 6 GHz. The preselector bands are matched to the frequency range of antenna elements to maximize overall system performance. One of the six channels can be factory configured with a separate local oscillator (LO) to work as an independent monitoring channel. The IZT R5506 features a high stability internal reference clock and an integrated Global Positioning System (GPS) module. All the sensor’s functions are remote controlled via the optical interface. The sensor is provided with a DF processor as an option. Further documentation is available on request. The modular design of the IZT R5506 offers the possibility of customer-specific mechanical modifications.